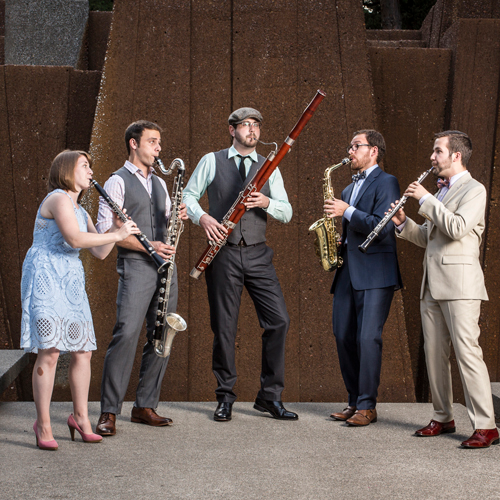 The 7-time national prize-winning and Ann Arbor-based Akropolis Reed Quintet celebrates its 10th anniversary with a special program featuring the world premiere of Sprocket, a new work composed by Steven Snowden for the quintet and a rideable percussion bicycle designed and built by Detroit metal artist, Juan Martinez. With support from the National Endowment for the Arts, High Wire Lab, and the Paul M. Angell Family Foundation, this groundbreaking composition celebrates Ann Arbor and Detroit's cycling cultures and the industrial heritage of our region. The culminating concert of their annual Together We Sound festival, the 7-time national prize-winning, Ann Arbor-based Akropolis Reed Quintet presents a special program featuring the world premiere of Sprocket, a new work by Steven Snowden for reed quintet and a rideable percussion bicycle designed and built by Detroit metal artist and Kresge Arts fellow, Juan Martinez. The bicycle creates unexpected and imaginative sounds including an accordion and an automated bell set powered by gears attached to the bicycle's pedals, and more. Featuring percussionist Zac Brunell who will also perform an additional work by Steven Snowden for amplified cactus, the program also includes the music of recent American Academy of Arts and Letters Music Award recipient, Stacy Garrop. Post concert meet-and-greet including a chance to play Martinez's percussion bicycle yourself! This concert is generously supported by the National Endowment for the Arts, Michigan Council for Arts and Cultural Affairs, High Wire Lab, and the Paul M. Angell Family Foundation. Steven Snowden has been described as “Beguiling… combining force with clarity” (San Francisco Classical Voice), “Wonderfully dynamic” (Interlude Hong Kong), “Rustic, red-blooded” (New Music Box), “Marvelously evocative”, (Cleveland Plain Dealer), and “The most wildly intriguing sight and sound I have experienced at a concert” (The Boston Musical Intelligencer). Writing music for dance, theater, multi-media installations, and the concert stage, his work often deals with concepts of memory, nostalgia, and the cyclic nature of historical events as they pertain to modern society. While his musical influences are deeply rooted in bluegrass, folk, and rock, he utilizes non-traditional techniques and processes to compose works that don’t squarely align with any single genre or style. Juan Martinez is a Detroit metal artist who creates fantastical, functional creations. Juan creates sculptures that live and work among us, drawing from his experience as a science illustrator and a fabricator working with metal, wood, and other materials. His work has been exhibited at Art Basel Miami, Museum of Contemporary Art Detroit, and in public and community spaces in Detroit, Los Angeles, and beyond. Juan’s artistic practice is informed by his commitment to community, with an emphasis on empowering and equipping Detroit youth for extraordinary futures. He is a co-founder of the Beehive Design Collective and the Austin Bike Zoo. More information about the world premiere of Sprocket can be found here on Akropolis' website.